Industrial Hygiene is the art and science of the recognition, evaluation, anticipation and control of human stressors in the human environment. Industrial Hygiene calls on the biological sciences, as well as the classical physical sciences. FACTs, Inc. is a private consulting firm providing state-of-the-art industrial hygiene and occupational and environmental assessment services. Our staff brings together a unique blend of classic industrial hygiene, sound science and analytical chemistry. With 24 years experience in industrial hygiene consulting, and ten years in analytical chemistry, we possess the foundation necessary to handle virtually all of your industrial hygiene needs. We have a presence on Facebook where we have provided photo albums and videos of various types of projects. Visitors are given the opportunity to ask questions and engage in discussions. Visit the Facebook location if you enjoy photos - or just post a question, and we will be happy to try and provide an answer! 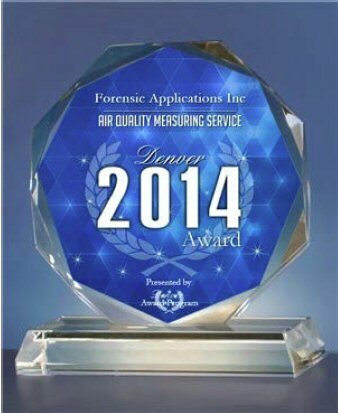 DENVER October 6, 2014 -- Forensic Applications Inc has been selected for the 2014 Denver Award in the Air Quality Measuring Service category by the Denver Award Program. Each year, the Denver Award Program identifies companies that we bel...ieve have achieved exceptional marketing success in their local community and business category. These are local companies that enhance the positive image of small business through service to their customers and our community. These exceptional companies help make the Denver area a great place to live, work and play. ﻿﻿﻿﻿﻿﻿﻿﻿﻿﻿Are mould screening samples valid? Damned Lies, and Lazy Authors﻿! Attack of the Killer Christmas Trees! Copyright 2010 Forensic Applications Consulting Technologies, Inc.. All rights reserved.